This episode confused many viewers, and made some feel that it was out of character for Peter to act as he did. However, I ate this episode up, as I loved seeing Peter take matters into his own hands. Truly, Fauxlivia ruined U2 for me at least. I can’t help but not laugh when I hear a certain song. Fringe producer/writer Joel Wyman confirmed that Even Better than the Real Thing was the U2 song lyric used as Fauxlivia’s computer password. Curious, since she was deceiving a man whose projection-self told Olivia that “real is just a matter of perception” in The Plateau. This choice also seems to fall in line with a theme for season four: What is Reality? The Fringe team and Massive Dynamic scientists believed that it was needed to power the machine, yet Peter’s presence activated it. Definitely gives meaning to "I can bring anything mechanical back from the dead." He was later able to use the device. The machine was stated to be attuned to Peter at the biological level. However, Peter appeared to emit some sort of differing energy signature that the device was able to recognize. Later, in Concentrate and Ask Again, Sam Weiss would mention to Nina that Peter could send off vibrations at varying frequencies, based on his state of mind. There is an odd connection to the beacon cylinder that appeared in The Arrival, which Walter said vibrated at either 2mHz or 4 mHz. Did this missing part cause some kind of harm to Peter? Peter’s sneaking around seemed to be a throwback to his days living as a nomadic conman. I couldn’t help but feel a degree of sadness for him though. To me, he felt like he was a burden to Walter and Olivia, and that he had to take action on his own. This falls perfectly into line with his favorite book, If You See the Buddha on the Road, Kill Him. The book explains that each person has their own journey, and that he or she can only learn from mentors - but can't rely on them for answers in the end. This is because each path is unique. Peter told Walter, “You can’t protect me from everything.” In the end, he’s alone. Olivia showed some concern for Peter, and he smiled so much in her presence. However, lying to her about his whereabouts, and omitting his role in killing shape shifters was tearing him up inside. Keeping things from his loved ones was a mistake in The Day We Died as well. He found the lake house key and went to speak with Walternate, leaving Olivia alone, and vulnerable. While he was being tested at Massive Dynamic, Peter told Olivia a bit of sarcasm when he said , “I think I might use my new-found superpowers to make this machine levitate.” Later, we’d all be amazed along with Olivia when Peter used the machine to create the Bridge between the two universes. Now that was impressive. Peter tried to alleviate some of Walter’s guilt, and topped off his words with a peanut butter and jelly sandwich. But Walter still felt inadequate compared to Walternate. His quest to regrow parts of his missing brain was an act of desperation. In the end, Peter and Olivia would have to be the ones to figure out the machine. However future Walter would play a large role in sending the machine back through time. In the end, Peter made the choices and Walter let him go… consequences unforeseen. Walter was highly disturbed by Peter’s unashamed killing and mutilation of the shape-shifters. He sternly told Peter, “This isn’t you.” However, Walter did not know his son during his 20’s. Peter had an unrevealed past, and I don’t think he ever told anyone of the things he did. Many have the impression that Peter had killed before he went back to the States with Olivia, and he began working with Walter. Who is Peter? He went through several personality changes in last half of the third season. The most odd occurred during The Last Sam Weiss, and was also a result of touching the machine. Touching the machine Over Here seemed to make him more forceful and focused like a soldier. However, the reciprocity effect of touching the machine while quantum entangled with its Over There counterpart seemed to make him confused, meek, and almost childlike. Did the machine really “weaponize” him as Walter thought? One theme of consistency with Peter is his search for answers. It’s what kept him working with Fringe Division, and he spoke many times of how much he wanted to find out what was going on and why. PETER: That's not good enough. We are so close. I can't let these guys get away again. They have the answers. I know they do. In The Day We Died, Walter cupped Peter’s face in his hands just like he did in a similar scene in August. He then explained how to cheat the rules of time. Peter got his answer. Why did William Bell collect the First People books? What became of the shape-shifter discs after Os? What was the purpose of the machine piece stolen by Fauxlivia in Entrada? Was someone working with Peter to kill shape-shifters? He was in contact with someone, and he had no time to kill Dr. Falcon himself. Did the machine actually do something to Peter in order to make him more aggressive? The shape-shifters will probably still be around, and may negatively affect the world since Peter did not neutralize them. What is it with shape-shifters and telephones? I really liked this episode when it first aired, mainly because it had a good storyline and it finally gave Peter something to do on his own (thought JJ was great in this episode, and the confrontation between him and walter at the end was brilliant). With the virtue of hindsight, i can say this episode was bad because everything of import that happened in it seemed to be forgotten! most notably peter being "weaponised" which was not mentioned once to my recollection after that episode, we did not even get to see Olivias true reaction to it because quickly after she found out she got bellivia'd, also the shapeshifter discs were never used, i mean whats the point of bellivia even saying "you need the key in my office" if their never gonna use them! ?, i have to say i think if the writers had stuck with the storylines from reciprocity (peter going bad, shapeshifter discs etc.) the second half of season 3 would have been a lot better than it actually was. I agree, JM, this was one of those episodes, that can be made good or awful retrospectively. Unfortunately, the writers decided it was a waste of their time and proceeded to forget about it, as soon as it ended. It's a shame, because it had everything to make it a compelling story arc, but it was about Peter and the producers/writers' crippling inability or disinterest in writing for him struck again and they never cared to show the cause or the consequences. It's like they're saying "Here's your Peter-centric episode, now leave us alone, we don't care, okay?" What was the meaning of this forgotten episode? Was Peter weaponized or was he simply fed up to be used by everyone? Why did he do it? Did he read all of Fauxlivia's notes? "What was the purpose of the machine piece stolen by Fauxlivia in Entrada?" They didn't say, so how did they manage to make the machine over here work? Did Massive Dynamic build an exact copy? That's the only thing that makes sense. Remember Peter used the machine over here to destroy the other universe and this is the machine that was sent back in time, so it must be complete in the future to find all the pieces in the present. "Who is Peter? He went through several personality changes in last half of the third season. The most odd occurred during The Last Sam Weiss, and was also a result of touching the machine." I'm not sure that was a result of touching the machine, I agree with Walter's theory, that it was due to the severe hit he took to the head. "Was someone working with Peter to kill shape-shifters? He was in contact with someone, and he had no time to kill Dr. Falcon himself." I think someone was helping him, but I doubt that person killed Dr. Falcon. 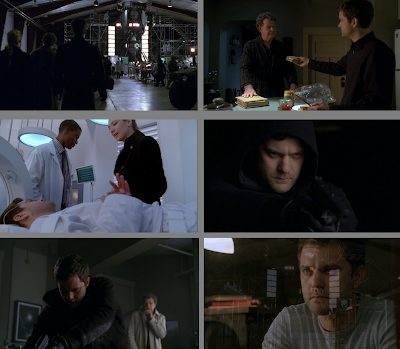 We don't know if Peter had enough time to kill Dr. Falcon, because there is no time context between some of the scenes and even if there was, Fringe is notorious for the liberties it takes with time and distances. Gr8 episode. The twist with Peter was refreshing. I keep reading how if peter never existed, so and so wouldn’t have happened but what people failed to understand is that all of this started the moment September distracted Walternate from the cure. Imagine Peter getting the cure on time, he would be better, living in his own world, no problems whatsoever. So folks, stop blaming Peter for everything wrong with Olivia, walter or the two universes. He was just a sick little boy who didn’t ask for any of this. Great comments Trent, It has to be said that even thought Fringe is an amazing show, their are several gaping holes in its plotline. Most (if not all) of these holes were opened in season 3 such as the machine piece stolen by fauxlivia (as you mentioned), the machine as a whole (which i assume will be addressed in season 4), reciprocity as an episode could be considered as the very definition of a plothole and the shapeshifter discs. I feel the writers expect us to 'read between the lines' too much when it comes to developments such as altlivia being in 'love' with peter etc. its like they expect us to know whats going on with the characters off screen. One scene i think that was definately needed to be shown during season 3 was peter explaining to Olivia why he killed the shapeshifters, her just forgiving him for this off screen is unacceptable, and in my mind made their relationship less believable, and also missed out on the oppourtunity for further development for both characters. There is still a niggling uncertainty in my mind that leads me to believe the writers know of these plotholes and are attempting to 'seal' them up with a reset. I forgot to mention, maybe this whole thing was the observers plan along and walter, peter and olivia were their pawns in their game. "One scene i think that was definately needed to be shown during season 3 was peter explaining to Olivia why he killed the shapeshifters, her just forgiving him for this off screen is unacceptable, and in my mind made their relationship less believable, and also missed out on the oppourtunity for further development for both characters." I don't think Olivia had anything to forgive here. I'm sorry, but he did nothing against her personally. He was killing soldiers from the other side. What is unbelievable is that she didn't care about his reasons or that he didn't feel he could trust her and this didn't bother her at all. I don't think a short conversation would have hurt. As for your last paragraph, I'm not trying to change your mind. I'm actually happy that you still have hope. That was more or less my state of mind last season, when they said exactly the same self-actualizing stuff. And look what happened. It is true that he is the character everything revolved around, although not anymore, because he never existed and whatever he did never happened. The thing is that, like Joshua Jackson said, he's the guy things are about, but he never gets much to do. It's all talk and no show. They keep saying he's important and the key, but they never write for him like they do for the other 2. After 3 seasons, it's futile to expect something different. If I wanted more evidence, I have the premise of the first arc: They will show how important Peter is, by studying the other characters without him. Translation: Same old same old, Walter and Olivia will get even more character development, while Peter is forgotten in the writers room. Oh but Peter is important, the characters will feel his absence! Job done. lol I have to say your last paragraph is pretty much unarguable. Although, I am still gonna keep my hope, and believe that pinkner for once isnt BS'ing us fans. I do remember him saying that peters connection with the machine would all be explained by the end of season 3, which it wasnt. And in the event you are correct atleast maybe broyles, nina and astrid can get some much needed screen time and development, lincoln lee you can f.off! The reason there is a section about Peter not existing is because those that write the rewatch posts were asked to include such thoughts. I am of the opinion that the world is a worse place without Peter. The shapeshifters that he dispatched in this episode, may still be around in a timeline without Peter, and innocent people may die as a result. Peter caused ripples, both good and bad. Just like every human being does. I thought the piece that Faulivia stole was sent over to the alternate world. That's why Walternate was able to activate it. Of course he also used baby Henry's genes.